What is turtle shell? What is it used for? 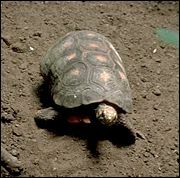 Turtle shell comes from soft-shelled fresh-water turtles, particularly the amyda sinensis wiegmann, which belongs to the trionychidae family and is native to China. These turtles have truly "soft" shells, which are comprised of thickened skin. They are highly aquatic animals that spend most of their time in and under water. Some turtles can be quite large, reaching more than three feet in length, and can be rather aggressive. They are used both as food and for their medicinal properties. Turtle shells are prepared by removing the shell, cleaning it and drying it in the sun. They can be used raw, or after being stir-baked with vinegar. They typically have a fishy smell, with a grayish-brown or blackish-brown outer surface and a whitish inner surface. In traditional Chinese medicine, turtle shell has salty and cold properties, and is associated with the Liver and Kidney meridians. Its main functions are to nourish yin and subdue yang, and to soften hardness and disperse nodules. Among the conditions turtle shell is used to treat are febrile diseases, deficient yin with fever, night sweats, and amenorrhea. How much turtle shell should I take? The typical recommended dose of turtle shell is between 10 and 30 grams, ground into powder and used in a decoction. What forms of turtle shell are available? Whole, dried turtle shell can be found at some Asian markets and specialty stores. Some shops also sell turtle shell powders, pills and extracts. What can happen if I take too much turtle shell? Are there any interactions I should be aware of? What precautions should I take? Turtle shell should not be used in patients who have deficiency and cold in the spleen in stomach, patients with diarrhea, or patients who have a poor appetite. It should not be taken by women who are pregnant or breastfeeding. As always, make sure to consult with a licensed health care provider before taking turtle shell or any other herbal remedy or dietary supplement. Cai WM, Tao J, Zhang BB, et al. Comparison of an fa te with bie jia ruan gan tablet on prevention of liver fibrosis. Zhonghua Gan Zang Bing Za Zhi August 2004;12(8):499. Chen J. Menopause: Western and traditional Chinese medicine perspectives, part II. Acupuncture Today, May 2002. Cohen I, Tagliaferri M, Tripathy D. Traditional Chinese medicine in the treatment of breast cancer, part three. Available online. Liu C, Liu L, Li P. A survey of researches on synergy and toxicity abatement of traditional Chinese medicine in radiotherapy of nasopharyngeal carcinoma. Journal of Traditional Chinese Medicine 2001;21(4):303-311. Riepell O. Turtles as hopeful monsters. Bioessays November 2001;11(23):987-91.